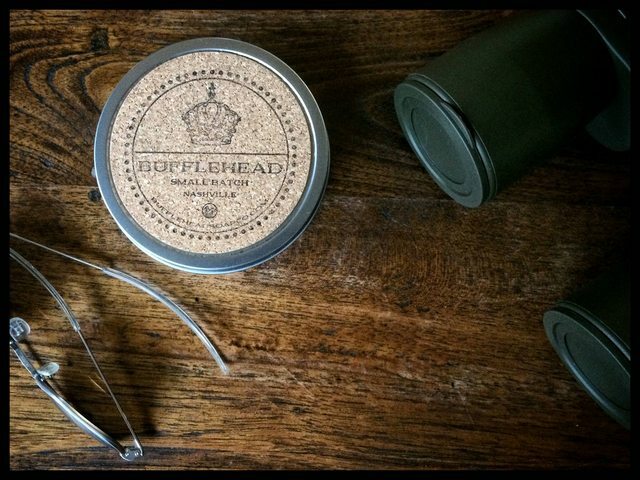 Packaging: Bufflehead ships in a metal, 4” tin with cork accents, a very tasteful and unique design. Initially, my only remark was that the outside label did not call out the scent however upon opening there is a second piece of cork inside the lid with the soap’s name. If you have an extensive collection this may prove to be troublesome in identifying but I actually like it. Scent: Brouhaha is a nice mix of floral components with a very slight citrus quality: lavender, lavandin, and bergamot EOs with a touch of rose absolute. A decent amount of scent strength and a subtle yet very pleasant mix conceptualized and blended inhouse . The composition is artfully done and executed in what is clearly a very thoughtful way by j-mt at Bufflehead. Performance: This is where things really get interesting. On initial lather I actually paused to look at the ingredients [Note: they are not on the tin but I visited the site later for specifics.] The Bufflehead soap is the slickest soap I have ever used! Ingredients call out Potassium Stearate, Water, Potassium Palm Kernelate, Glycerin, Potassium Tallowate (Duck), Fragrance, Blush Kaolin Clay. Of note, all the ingredients are ethically sourced including certified sustainable palm ingredients and free range/cruelty free duck fat. The soap base is very easy to lather, with wonderful cushion and slickness. Post shave is remarkably good as well and I would rate Bufflehead as absolute top tier. If you use a straight, you are in for a treat. DE/SE shavers, hold on to your horses. Or ducks. Customer Service: I don’t have extensive experience with Bufflehead customer service other than to say that the product was well packed and included a hand written note describing the scent. Clearly an artisan passionate about both their product as well as the experience of receiving and using. Final Thoughts: This is a Tier 1 soap and can hold it’s own with anybody in the market. The performance is extremely good, scent complex yet approachable. Limited availability is the only drawback to this fantastic soap but it is well worth any wait and has quickly taken a spot as one of my favorites! Thanks for the feedback and the picture! I'm glad you're enjoying it. Fantastic review Kevin! Thanks for posting this. Bufflehead is on my list! Especially with your comment about slickness, I'm really looking forward to trying a soap from this brand. (04-27-2016, 08:35 PM)NeoXerxes Wrote: Fantastic review Kevin! Thanks for posting this. Bufflehead is on my list! Especially with your comment about slickness, I'm really looking forward to trying a soap from this brand. Kidding aside I have not been as pleasantly surprised in a very long while at the performance of a new [to me] soap. Really great and as a slickness junkie, this is a must have. LOL . I really like the packaging from what I've seen of the brand. The cork, crown, and font combination is really interesting to the eye. Did you find the soap protective? How was the texture of the lather? Very rich lather. Quick to shape and a thick consistency. Water tolerant. The slickness was again so significant that it made me pause, grab the tin and search for ingredients to see what was going on. I later looked on the Bufflehead site as they weren't on the tin. Regardless, I would not hesitate to recommend this soap to even the most discerning wet shaver- it is a top tier product and only a matter of choosing a scent. Post shave is excellent; very moisturizing. The best way to sum up: a luxurious shave. Sounds great Kevin. This is one of those soaps I've been looking at for a while. But alas, every time I think of going to the site it's out of stock. The duck fat is definitely intriguing though. Is this soap rarely produced? I haven't seen it available anywhere. (04-28-2016, 03:41 AM)NeoXerxes Wrote: Is this soap rarely produced? I haven't seen it available anywhere. It's a small batch production. In another thread, j-mt mentioned his wife is due any day now with their first child. I believe he mentioned production will pick back up this summer. Thanks for the information! Somehow I missed that. Early congratulations to j-mt and his wife .